This sivasthalam temple is located in Karaikkal town at a locality known as Koilpatthu. The temple is at a distance of about 2 Kms from Karaikal bus stand. Another paadal petra sthalam Tirudharmapuram is located nearby. Swayambumurthi Lord Shiva is facing west. The rays of Sun fall on Lord for 10 days from Panguni 13 in (March-April) during the evenings Avani paddy sowing festival in (August-September) is grandly celebrated in the temple. Devotees pray here for child, wedding and education boons. Devotees perform abisheks to Lord and mother and offer vastras. Sri Parvatheeswarar Temple, Tiruthlicherry-Karaikal Pathu, Karaikal-609 602, Puducherry state. Contact Number - +91 4368 221 009, 97866 35559. Lord of the temple is praised in the Thevaram hymns of Saint Gnana Sambandar. 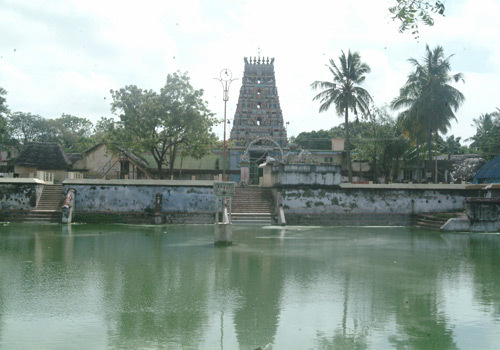 This is the 50th Shiva temple on the southern bank of Cauvery mentioned in Thevaram hymns. With its 5 tier Rajagopuram and two prakaras, Lord in the temple is facing west. The Maha Mandap and the Artha Mandap are on the left side. Lord in the sanctum sanctorum has seen the rolling of four Yugas. Lords Vinayaka, Muruga with His consorts Valli and Deivanai, Ligodhbava, Dakshinamurthi, Chandikeswara, Nataraja, Bhairava, Chandrasekhara and Mothers Mahalakshmi, Durgadevi and Saivite Acharyas, Navagrahas the nine planets, Sun, 63 Nayanmars and Sani Bhagwan are in separate shrines in the prakara. Lord Vinayaka is praised as Sambanda Vinayaka. The rays of Sun fall on the Lord during evenings for 10 days in the month of Panguni from 13th (March-April). Mother Parvathi born as daughter of Sage Kathyayana, performed penance here and joined Him here. As She performed Tapas penance, She is praised as Tapasvini and Parvathi Ammai. She blesses devotees with wedding boons. Lord Shiva with His name Kiradhamurthi appears in a hunter form. Saint Gnanasambandar was intercepted by some belonging to a different religion when he came to this place. The saint appealed to Lord for a solution. By the command of Lord, a thunder fell on them yet they could not be corrected. They said that Saivism was not a religion superior to theirs and challenged Sambandar for a debate. Sambandar accepted the challenge and defeated them. Accepting the defeat, they too embraced Saivism here. King Ambarisha prayed to Lord here and was blessed with a child. Lord thus came to be known as Raja Lingam. He is also praised as Bhaskara Lingam as Sun worshipped here. Bhaskara is the other name of Sun. The place was known as Brahmma Vanam in Krutha Yuga, Sameevanam in Thretha, Ananda Vanam in Dwapara Yuga and Mukthi Vana in the present Kaliyuga. Due to failure of monsoon as famine raised its head, Chola king prayed to Lord to save his subjects from starvation. Lord came in the form of a farmer, sowed paddy seeds in the fields. The place was freed with good yields from famine. As Lord Himself sowed seeds here, the place came to be known as Tiru Theli (sowing), cheri-place Tiru Theli Cherry. After worshipping Lord Darbaranyeswarar in Tirunallaru, Saint Ganasambandar was passing through this place, not noticing this temple. Lord Vinayaka called the saint 10 times, made him turn back and sing a Pathigam-10 verses. As Vinayaka called (Koovuthal in Tamil) the saint, He is praised as Koovi Azhaitha Pillayar. This name changed as Koil Pathu in the days that followed. Chaya devi was sad as her husband Sun God was not affectionate to her. Knowing this through Maharshi Narada, her fathr cursed Sun. Sun lost his shining glory. He came to this place, created a spring and worshipped Parvatheeswarar and got the relief. As Sun Bhaskara worshipped here, the place is known as Bhaskara Sthala. Lord in the temple is swayambumurthi. The rays of Sun fall on the Lord for 10 days from Panguni 13 in (March-April). 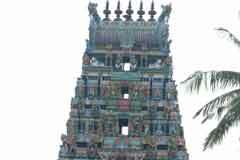 Manicka VannarTemple, Marugal, Nagapattinam, Tami..
Sri Aludayar Temple, Uyyakondan,Trichy, Tamil Na..